Clarkes test is used to diagnose a degenerative condition called Chondromalacia of the very thick hyaline cartilage under the knee cap. Your chiropractor will place his hand over your patella, press gently downwards and towards your foot. Now, VERY GENTLY, (may I repeat this!!! VERY GENTLY) contract your Quadriceps muscle, the large thigh muscle. When this test is positive it may be extremely painful. The kneecap is forced up and over the groove in the femur. If there is degenerative change on either side - the femur or the patella - then you will feel a grinding sensation, and sometimes extreme pain. 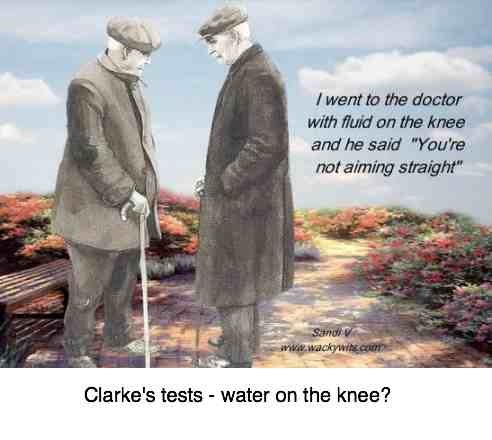 Done artfully, Clarke's test is very useful for the diagnosis of a condition called Patello Femoral Pain Syndrome which responds magnificently to chiropractic care. Even when thin whisps of calcium can be seen on x-ray - we call it calco-chondrinosis - PFPS responds very nicely to gentle mobilisation of the patella. Treatment of PFPS is really quite simple. The knee cap is mobilised (may be painful as the arthritic hyaline cartilage crystals are gently polished away), you will apply ice at home, and some gentle exercises involving the Quadriceps muscles must be done. HYALINE CARTILAGE ... at the heart of knee pain. The stuff under the kneecap. This has implications for other conditions such as Frozen Shoulder which are often also associated with calcium crystal deposits. To go from Clarkes Test to the treatment of Patello Femoral Pain Syndrome treatment. MACKEREL RECIPES ... fish oil is highly recommended for arthritis RICH IN Omega-3.